What is your favorite Loco; Post a Pic' & tell us why. The Somerset and Dorset Joint Railway (S&DJR) operated between Bath and Bournemouth in the West of England from about 1862 to the 1960's. There were spurs to Bridgwater and Burnham on the Bristol Channel Coast with the major engineering and repair works at Highbridge. There was a separate wagon and coach works for the railway. Throughout the life of the railway locomotives were bought-out from major builders in the UK, and other railways locomotive works. No25A is of particular interest because it is one of only 3 locos undertaken as a complete build by the Highbridge Works. It was built in 1885, rebuilt in 1897 with modifications to the cab and the saddle tanks. The "Dazzler", as it was known, saw service on the railway until 1930, making up coal trains and shunting empties to and from coal mines in the Radstock area. It completed 421,712 miles doing these meanial tasks. I think small is beautiful, and this engine represents a real workhorse that has style and an attraction about it; with a long history too. USRA heavy Pacifics and all their many clones, especially the the modernized 1940's versions. ANY modern 80" drivered Atlantic from North America. Big locos for big railroads to cross big mountains. The C&O H-8, K-4, K-3, F17-19, USRA light Mike in almost any configuration, and the C&O unstreamlined Hudsons. I'd agree with Sheldon on most of his choices. I do have to disagree about "big mountains." The Blue Ridge, the Appalachians, the Alleghenies are all beautiful, but big they ain't. to get big in the U.S. you have to go west about 2000 miles and stare at the Front Range. As Crocodile Dundee told the mugger, "Now this, is a mountain." OK rugged might have been a better adjective. While maybe not as Big as the rockies, they often required steeper grades and sharper curves to pass through. There is, of course, the Saluda Grade, and that's not even really in the Blue Ridge. And I will tell you, nobody would lay track between Gordonsville, VA and Sugar Grove, WVA willingly. Well, I suppose this comes as no surprise but here are two of my favorite locomotives! An ICRR 'heavy Mountain' ... nicknamed by the ICRR as "Big Berthas" (#2600 series). 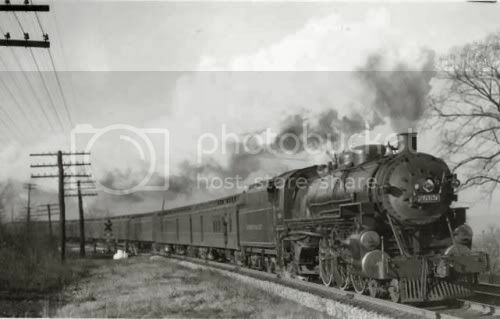 An ICRR 'heavy 2-10-2. The largest of this locomotive, the #2800 series. Im going to pick two. The first one I saw many times myself. it was the most common road diesel during my "formative years" as a young railfan in the 1980's! 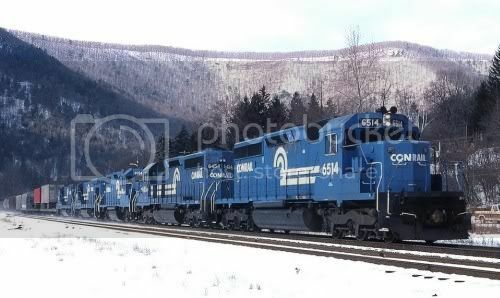 The Conrail SD40-2. I nominate the entire class as a favorite. The second is one specific locomotive..which I never saw personally since it was scrapped several decades before I was born. But I watched those Conrail SD40-2's run by her birthplace. She was built in Sayre, PA. the same town where I was born. Both of my Grandfathers probably worked with her. 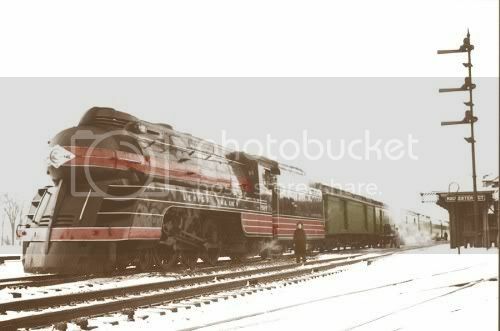 Lehigh Valley 4-6-2 2089, built in 1925. The last "home grown" engine built by the LV. Here she is "as built"
And later streamlined for the 1939 edition of the "Black Diamond Express"
I do not have any pitures (see the Bachmann catalog). My favorite loco is a 3 Truck Shay because I got to actually drive one at Roaring Camp and Big Trees NG RR in Felton, CA. THAT was a great expience. Look them up on the net. i have 2 bachmann gp30s in B&O colors and some gp38\40 locos in various paint schemes, reminds me of years gone by, watching coal drags and freights rumble by the house, i always liked those yellow\black and red chessie geeps , they seemed so clean [of course they werent] next to the older blue B&O locos. I was hoping this string would be for Steam only. Diesel bores the socks off me; unless it has some abiding technical feature of being the first at something! then you should have asked "what is your favorite steam loco?" Scot : O'k, now you know. Trains from other countries, UP Big Boys, diesels made after 1960, are all barely on my radar, but I do know lots of others find interest in these things, and they do have value. Stewart - What about learning from the other tribe? I admit it, I've spoken with them and don't want their way of life, but I thought you where different?